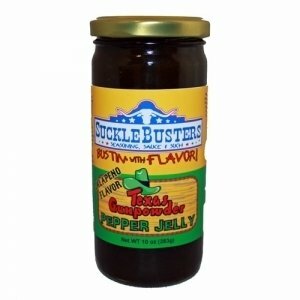 Made with fresh Texas Jalapenos, the sweet and spicy treat is excellent on toast, biscuits, pancakes, waffles or any breakfast food. Add crackers and cream cheese for a quick, easy and delicious party appetizer. Can also be used as a glaze on BBQ and grilling. All natural, no preservatives. Ingredients: Sugar, jalapenos, apple cider vinegar, pectin and citric acid.